Perhaps Bronco is trying to restart what has been a quiescent Luft '46 market as few if any new kits have been done over the years. I am not sure if this subject has been produced by either short run or resin kit, but this one is neither. This is the third boxing of this kit that I have seen, though I've not gotten review kits in any sort of logical order (as in by kit number). Research shows that there are at least six, though I'm not sure if they have all been released. The nose is separate from the rest of the fuselage, and this may well mean other similar aircraft will be offered in the future. There is a small bomb bay area in the back with a separate door that effectively seals off this area. A four piece engine will fit under the right wing and both wings have large tabs that go into slots in the fuselage. Where this kit deviates from the other two releases is by what is carried underneath it. In this case, it is the Italian LTF5b torpedo. 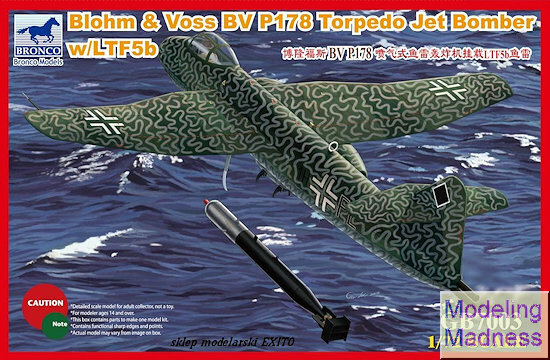 As a result, where in other releases there was a bomb or a torpedo/bomb sprue, in this one there is a sprue for the LTF5b. 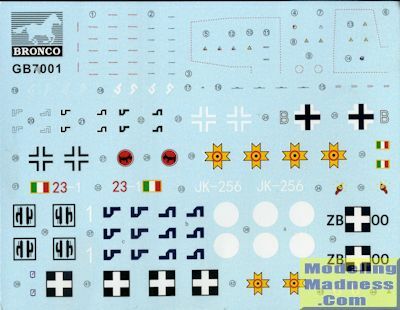 This sprue also includes the torpedo attachment pieces. One of the last steps is attaching the forward fuselage piece, but I'd do that prior to gluing the wings in case the seam needs attention. Both a single piece and multiple section cockpit covering is provided. 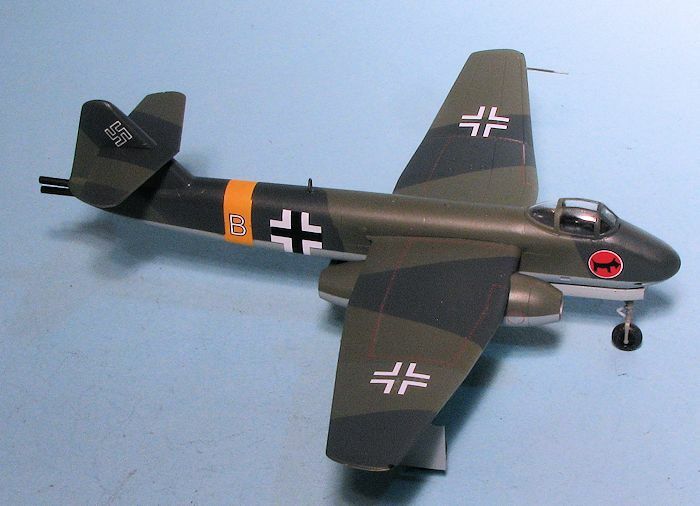 I have always liked Luft '46 subjects and still have quite a few kits from a decade or so back when these were really hot items. I like that we are seeing new ones and perhaps it will help the genre take off and become popular again. I built the bomber version about a year ago and found that it went together very well, as you can see by the rather large image to the left. The biggest issue was finding room for the nose weight. 10 grams will not fit in the front of the nose so you have to pretty well cram weight everywhere you can forward of the main wheels. This includes the forward part of the torpedo. As you can see, it can be done, though Bronco also includes a clear tail stand in case you were unsuccessful!